The Time has come to finally sit back and enjoy your amazing water feature. Weather you put it in yourself, or hired professionals for the installation you are ready to take in the ambiance of this amazing… wait, what happened to the fish that were in here. I know I had three, now there is only one. And why are those rocks overturned? Vandals? 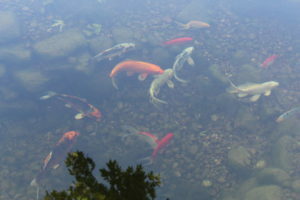 Depending on where you live, your pond and koi fish can fall victim to an array of unwanted guests. 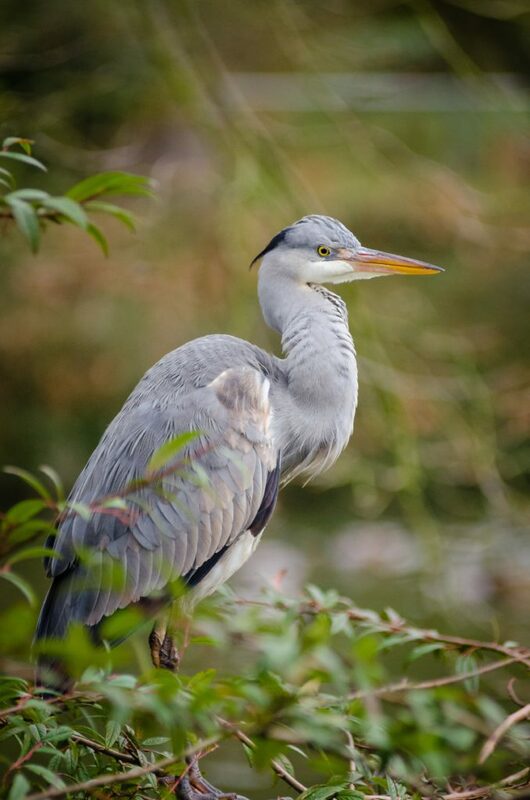 From the dreaded blue heron that will feast on your prized koi. Even raccoons and chipmunks pose a threat to your beautiful creation. The predator that concerns me the most is the blue heron. In my part of the world this fisherman is always on the top of its game. A perfect example of how nature has created the perfect fisherman. With its spear like beak and the “S” curve of its neck, always ready to strike with speed and precision. 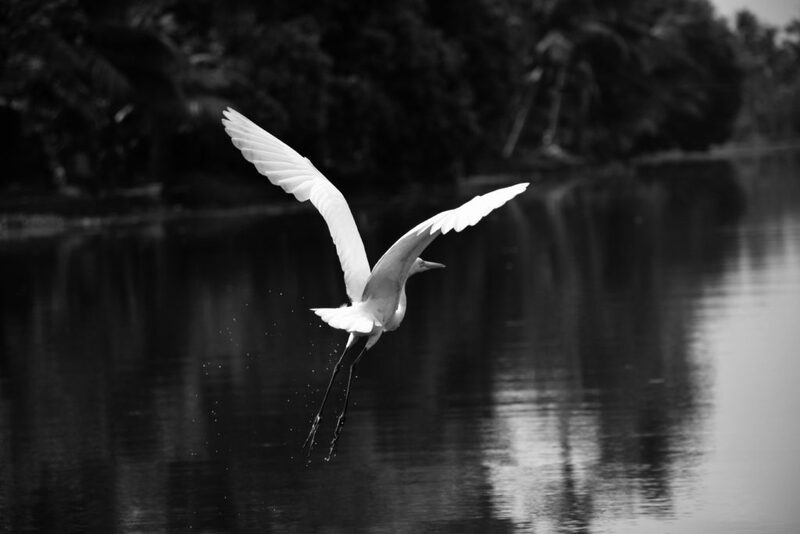 It will land in the shallow waters, and remain perfectly still. The patience this bird has is incredible. It will stand there, stoic waiting, waiting then bam! Lunch! These birds fly by scoping out promising hunting grounds from the air. This bird will darken the sky when it flies overhead, as if some mythical beast has just spawned from middle earth. Its legs stretched out behind it as it flies. At first glance you may think you are looking at a pterodactyl, or something prehistoric. Decoys – You can use decoys to keep them away, but keep in mind that you are dealing with an intelligent advisory. They will learn that decoys are just that, decoys. As long as you keep them moving around your space decoys will be effective. Water spray – A motion sensor device designed just for this shoots a stream of water when it is triggered, keeping away many nascence animals. Water Dye – This is another tactic that can be used to ward off herons that are looking for a free lunch. The dye will make your pond look deeper than it truly is and help hide your fish from the sky. I’ve even heard of people going as far as putting rebar grates over the tops of their ponds. To me that seems like overkill but I suppose once you lose a koi or two you may see things differently. 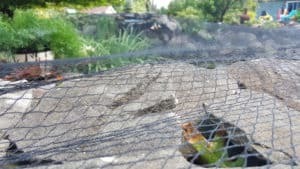 Pond netting could be the answer if you don’t mind clearing the debris that gathers on it every now and then. 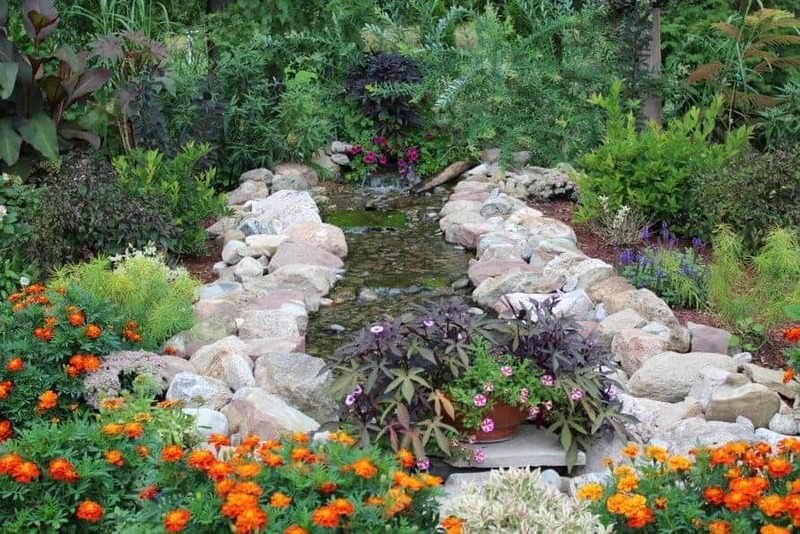 If you enjoy your pond from a distance, then this would work well for you. The black netting is very difficult to see from a distance and will keep just about anything out. When it comes to netting, I use it for a different purpose. I don’t bother with the net until the leaves start falling in autumn. When you build your pond, the best practice is to build it into shelves so there are steep drops, then a level shelf, then another drop, and so on until you reach your desired depth. One reason for this is for planting. This way you could enjoy different species of plants that need different depths of water. The other reason for this is to keep out predators. If you had your edge gradually go down into the water, it would be more like a beach. This would be an open invitation for raccoons, weasels and the like who would all love to make a meal of those beautiful koi. The gradual decline gives them easy access in and out. In order to combat this, when you dig your pond dig it in layers. This has two advantages. One, raccoons and the like will only be able to get what they can immediately reach. Two, the layers are perfect for planting different types of vegetation. Not all plants prefer the same depth in the water. Although your biggest threat may seem to come from the sky, do not overlook other dangers that come from the ground. 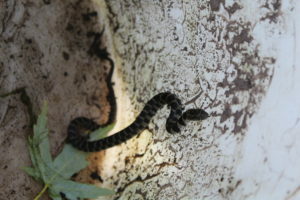 This tiny water snake attempted to make a home in the pond skimmer box. If not taken care of my fish may have been inn danger as the snake got bigger. 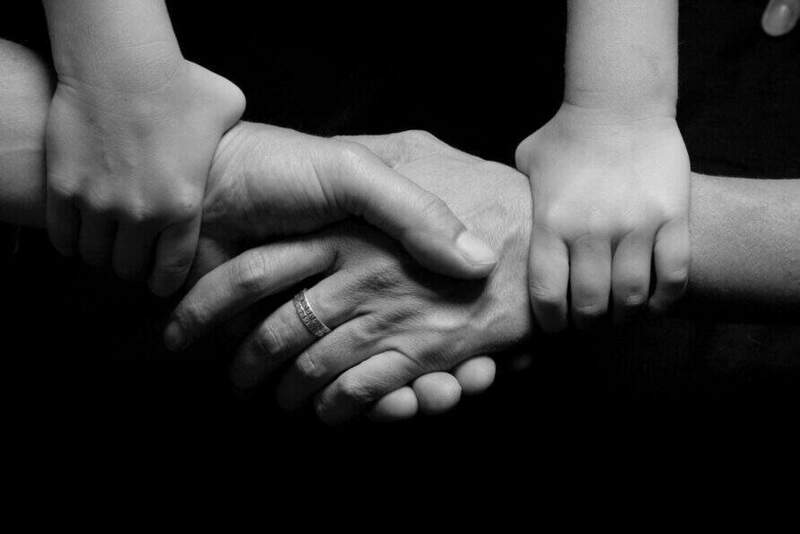 An ounce of prevention is worth a pound of cure as the old saying goes. Having a pond also attracts all sorts of other inhabitants. A pest is a very objectionable word. It’s the same as calling something a weed. A weed is just an unwanted plant. One persons weed is someone else’s pride and joy. It all depends on how you look at it whether something is a pest or not. 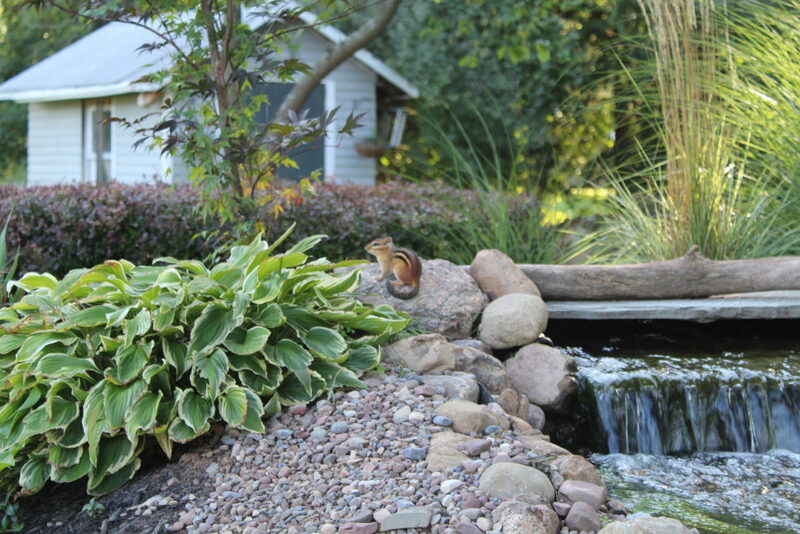 Right now my pond has attracted this crazy chipmunk who has turned my waterfall hill into Swiss cheese. For the time being its fine. He is fun to watch scamper about. As long as he isn’t doing damage he can stay. He also adds an element of entertainment to the space. 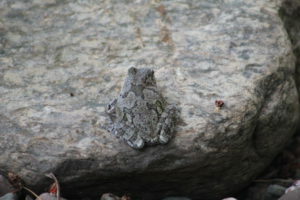 Chipmunks aren’t the only things that the pond brings into your yard. The variety of birds that grace my pond with their presence is astonishing. 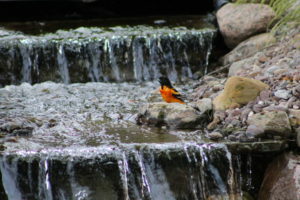 Birds I have never seen in the wild before now bathe themselves in the rushing waters of my waterfall. I have seen Orioles, yellow finches, sparrows, cardinals, blue jays, and other birds I couldn’t recognize. This has awakened my curiosity and now find great pleasure in bird watching. 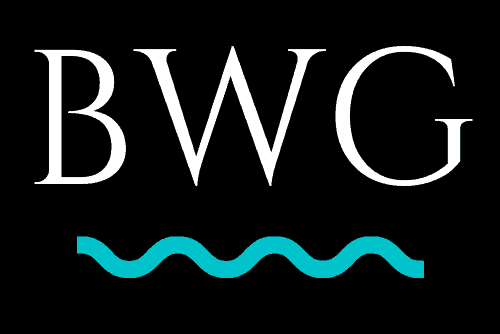 We have even downloaded an app that plays specific bird calls to coax some rare breeds to our water garden. Frogs and toads are another added bonus to pond ownership. There is nothing sweeter than a frog song in the midsummers night air. Mosquito control is another perk for inviting these wonderful creatures into your space. It’s a good idea to put some kind of preventative action into place before your pond turns into a buffet. However, if you go too overboard it will cut down on your overall enjoyment. That’s the main reason you have a pond in the first place. The key is, just like everything in life, to find the perfect balance of keeping your space safe without taking away your overall enjoyment. If you have any tips or tactics to share, we would love to hear them. Please leave a comment below. 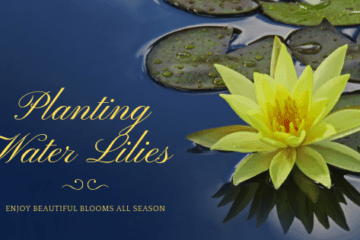 Be safe and happy gardening!